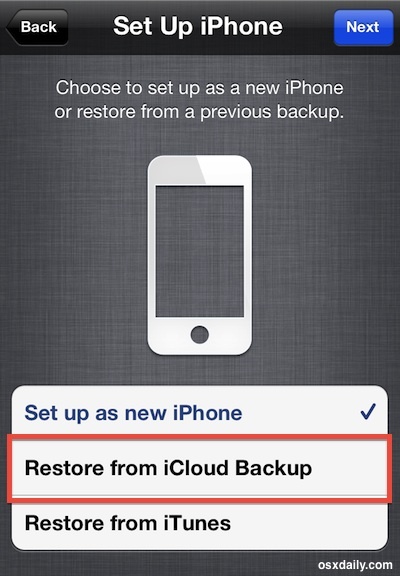 Restoring an iPhone to a previous backup is really easy, and though it’s fairly rare that you will need to restore an iPhone, or any other iOS device for that matter, it can still be necessary from time to time. What restoring from a backup does is pretty straight forward: it clears everything off the device, installs a clean version of the iOS system software, then recovers all personal stuff to exactly what it was like from the last backup. 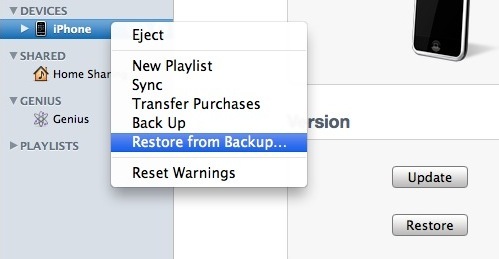 This is one of many reasons why making regular backups is recommended, particularly if you’re participating in any major iOS upgrades, adjustments, or tweaks (jailbreak or otherwise), because it lets you return to the last guaranteed functioning state of the device, with all of your data, apps, and customizations intact. If you’re new to the process of backups and restoration, don’t let the technical sounding nature make you shy away from the process. It’s actually quite easy with the iPhone, and we’ll show you exactly how to do it either from iTunes, if the phone was synced and backed up to a computer, and also how to do it with iCloud, if the phone is backed up to Apple’s remote servers. The iCloud method is by far the easiest, most applicable to new iPhone users, and it’s also pretty quick, so we’ll cover that first, but feel free to jump below to the iTunes method if that’s what you would rather do. Let the iCloud restoration begin and finish itself, this may take a while depending on how much stuff you had backed up and how fast the internet connection is. Don’t interrupt the phone during this process and don’t let it run out of batteries either, otherwise you can end up with a ‘bricked’ device that requires a manual hard restore through recovery mode, which is a much more complex process. If you find that the last synced time is not particularly recent, you just need to backup your iPhone more often! Keeping frequent backups is a good idea across all devices, whether its your Mac, PC, iPhone, iPad, or whatever. Be aware that both the iCloud or iTunes process restores just about everything, including the contacts, calendars, notes, iMessages and text messages, phone calls and call history, apps, app settings, and general system settings, but it does not revert to prior versions of iPhone firmware or baseband, which is generally impossible these days, nor does it wipe the iPhone and restore to all factory settings, which is a different process in that the phone is basically reset and then appears as if it was first turned on out of the box (in other words, there is no usage of the backup). If you’re accustomed to the world of iOS modifications and jailbreaking, you’ll find the process to unjailbreak an iPhone or iPad is quite similar. Restoring from a backup can be a meaningful troubleshooting trick if you’re experiencing many unexplained problems with the iPhone. If things are just running weirdly, battery drains exceptionally quickly, apps are crashing or just aren’t working properly, and when there is quite clearly a problem with the iOS system software or some specific settings on the device. In most cases, a complete restoration will resolve such a problem, but if it doesn’t then you may need to take further actions through the official AppleCare line or Genius Bar. BEWARE: restoring from a backup to a different device than the original backup device (like if you upgrade or get a AppleCare replacement) will NOT restore your non-apple application data. You will need something like http://priddysoftware.com/software/iPhoneRescue/ to get at your application data but restoring that data is another issue. I am an iOS developer with productivity apps out there who has experienced this pain. I really dont understand why apple is not allowing the restoration of the non-apple application data to upgrade/replacement devices. I restored my Iphone but ran out of disc space on C:/ when I restored my backup. When I connected my Iphone again – it made a fresh backup of the restoed “clean” Iphone. How can I get hold of the previous backup? It says I need to put a password, I put my password in my iTunes account but it didn’t work. What will I do now? Thank you so much! The restore is the one that worked for me, but it was pretty scary going through all the other options first and none of them working! Thanks for all the help! I agree with Sad. My iTunes will not accept my real password. Is their a default password? I’ve never been able to update new iOS versions so I went to apple store n all they could do was update it but all my data would be erased until I backed it up w/pc. I last recall the rep telling me in order to first access or unlock it was to input a simple four digit code but don’t remember if it was my last four of social or last four of ph # but at the time I did it n it worked. Now that I need iOS 5 I must restore n backup but since no password was recognized so I had no choice but to go with set up as new iPhone n now I backed up pics, music but NEED my notes n contacts. How can I get my contacts? What is the default password? For all of you that don’t know the password that it request it’s the one that you used to encrypt your back up data. If you go to the screen that shows your iPhone when you connect it, it shows a check box that says “encrypt iPhone backup”. If you already have that checked, then all you do is use your password that you set for it. I just downloaded software to a jailbroke iPhone. Questio I put my sim card inside the slot and it is searching’s for an internet signal how do I get it to find I try and let it find it by itself and try to type it in with no success. Any answers? Thank you, this was perfect! I had to get a replacement phone and the restore was interupted and I could not figure out how to get my settings back and this did the trick! Thank you, thank you!! I upgraded to ios5, then do the restore from backup but it asks for password to unlock the backup file and actually, I did not set a password for it and don’t know what to do. Any comment? Awesome, thanks for that, worked perfectly. I accidentally synced contacts and got the dreaded duplicate thing going on AHHHHHHH. Ho w do you stop that going on and why doesn’t it look for old entries and ask to update I now only update on my contacts on the phone but would love to know how you can replace all the ones on the computer with the ones on the phone, cleanly. I have an iPhone 4 jailbroken on ios 5.0.1 unfortunately I had an issue where i’ve had to delete my whatsapp, now I’ve lost my chat history, and because Apple have released ios 5.1 and not signing 5.0.1 anymore, my question is this… Is it possible to do a restore from last backup and retain firmware 5.0.1? with the hope of getting my whatsapp history back? I searched everywhere for an answer with no clear answer. My phone was just jail broke! I did my backup and I tried to restore it. I tried it like 10 times and everything works out fine it’s just that iTunes doesn’t recognize this restore on my phone so it’s impossible to add app or music on iTunes! Thank you so much. I lost for about touch skin fail. hi there, i restored from backup and it worked fine, except for my contacts. they did not get restored! how do i go about this? please help. i need my contacts badly! please any help? everything got restored, including photos, notes, calender events, ..etc. EXCEPT the most important thing …. MY CONTACTS!!!! It worked for me …. I got my contacts back !!!! if u r asking for a password while restoring ur backup..just put ur old password used to lock ur phone. it can be any..it worked for me…i tried overnight resolving my problem. 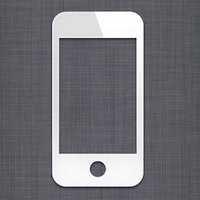 hi guys i need help, i purchased a second hand iphone 5c ios 7 it was working fine for me but then i decided to give it to my son, i want to set it up as brandnew, so i reset the factory settings of the phone, the problem is when im already trying to activate the phone, the previous owners find my iphone is activated and i can’t reach him anymore for him to turn it off. therefore, i cant activate the phone. what are my options here? When restoring my iPhone, I lost my notes and text messages. How do I get them back? 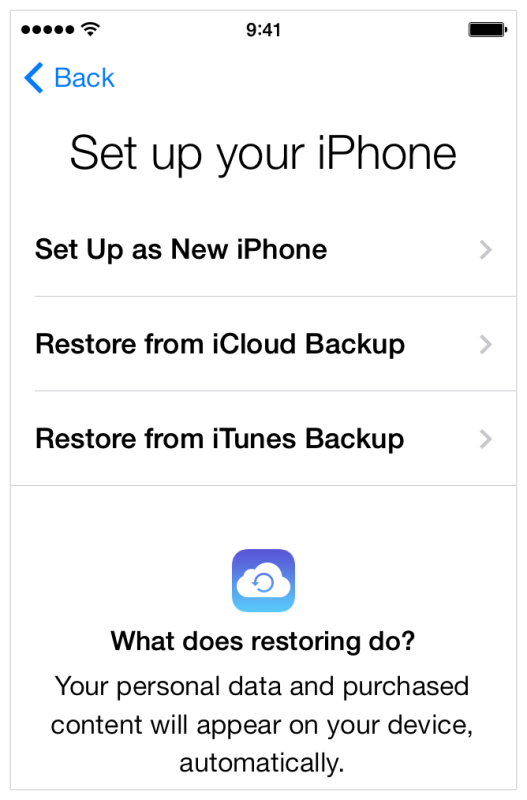 I backed up with iCloud just before restoring the phone. Please help. I plan to buy an iPhone 6S Plus from a client, but they want me to transfer all their data to their old 5C. I backed it up in iTunes, then plugged in the 5C, but the 6s backup is nowhere to be seen from the drop down list! The 5C is 32GB and the 6S Plus is only 16GB, so I don’t know what the problem is. Any ideas? My iphone keeps restarting while i am trying to complete the back up after I erased it. what should I do?